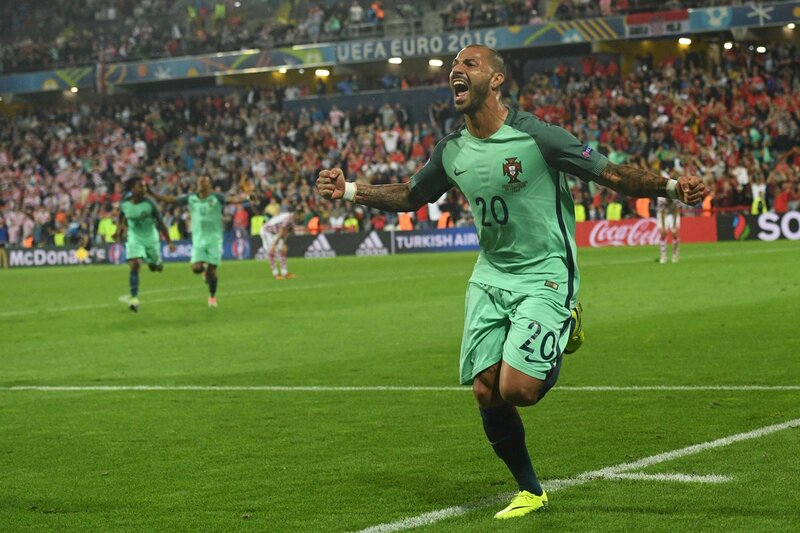 Ricardo Quaresma sent Portugal through to the quarter-finals of Euro 2016 as his header with little time remaining thwarted Croatia after a fairly dull affair in Nice. He nodded in from close range after Ronaldo's shot was parried by the keeper in the attack that followed Croatia hitting the post, just as penalties looked inevitable after both sides struggled to impress. Following a powerful rendition of Lijepa naša domovino, Croatia got the ball rolling, holding possession confidently in the early stages while trying to exploit space with long balls towards the left flank. Meanwhile their opponents had trouble stringing passes together in a somewhat tentative start to the game, as both nations were aware of the risk and magnitude of the 39th game of the European Championships. But when Fernando Santos' men began to flow with their play, a gaping opportunity would arise. João Mário whipped in a free-kick from the left, which went over the defence and towards Pepe who headed over the crossbar, taking advantage of a slip from an opposing player in the area. Though soon enough there would be something to worry about at the other end, when Ivan Perišić broke free down the right, surging towards the box where he moved on to his left boot, unable to find the near post as he dragged it towards the side netting. The Croat was sporting a patriotic haircut of red-and-white checkers on the side. It was an opening period for the purists, essentially, with mostly half-chances comprising the bulk of the first 45 minutes. Despite looking good in the final third, Croatia made sloppy mistakes while the Portugese did offer some substance going forward, but not enough to threaten the goal of Danijel Subašić. Both teams had a lot more to offer going into the interval, and it was down to the managers to make sure they showcased it. With the game demanding more urgency in the second half, Croatia upped the tempo with their pressing before a chance came for Brozović who couldn't find the target. They had more of the desire to get into attacking positions although Portugal themselves were beginning to stretch their legs going forward. Renato Sanches, fresh off the bench after replacing Gomes, exhibited his danger early on with some quick footwork to dazzle his opponents outside the area, before he gave it to João Mário who rolled it off for the shot, but the 18-year-old was unable to cleanly swipe it and it rolled wide. Back at the other end, Domagoj Vida would produce the closest chance of the game yet, just after the hour-mark when his header flashed past goal. Srna's cross from the left was nearing Mandžukić, but Vida propped up before him and knocked it just wide of the post. Things were beginning to open up, with Nani then landing off target after getting on the end of a long ball. Perisic then volleyed wide as both sides deployed their resources to steal the game. A back injury for Mandžukić in the late stages of regulation would eventually force him off, as both sides battled throughout and with 3 minutes of stoppage time, a late set piece by Rakitić was firmly headed away by Ronaldo. 90 minutes had passed, and extra time was now in store. What followed was a drab first half of the extra-time allocations and still no shots on target followed; neither side showed they really had the intent as penalties loomed in Nice. Croatia did have more control, but all was still to be decided. After Nani came close, a header went over the bar from the Croatians, before the closest chance of the game presented itself to the white-clad contenders, when a looping header struck the post. Immediately, Portugal attacked at the other end with searing force provided by Sanches. It was played out to Nani on the left, who scuffed his shot so it ran along the ground to Ronaldo, who was stopped by the keeper, but the rebound came out kindly to Quaresma who headed in from close range as Portugal booked their spot in the quarter-finals. Croatia were not done though, and would continue to throw the kitchen sink at their opponents to force penalty kicks. Vida scooped just wide of the goal as it fell down to him in a corner kick after a prolonged period of pressure. The game ended up picking up in the final minutes, but Croatia could not get the goal back, and Portugal made their way to the quarter-finals.